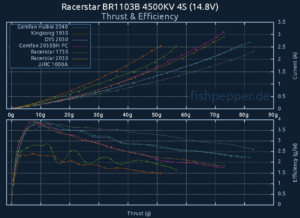 Thrust testing 110X motors — Time for the truth in numbers! This is the first post in a series of 110x motor thrust tests I will be doing in the next few weeks. As you might have read I am currently in the planning phase of a new micro brushless copter: It all started around a year ago with my ultralight 1S record breaking pepperF1SH design: A custom FC and ESC design allowed me to build something that was not expected to be possible at all, a 30g brushless quadcopter that featured full FPV capabilities. As time went by it became clear that there is room for some more power. The idea for the 2S pepperFIISH power horse was born and executed, again, with a custom new ESC design. My next prototype will follow this path and add some more power, the new ESC prototype is close to being finished and it is time to decide which motor and propeller combination to use. Luckily for you and me, Charles from RCBenchmark.com stepped in and offered some help by sending me one of their 1580 series dynamometer test stands. This allows me to automate a lot of this testing plus I get a lot more data than my previous very limited manual testing I did for my 1S copter. All tests will be done on the 1580 series dynamometer with a minor modification: The original 5 Kg thrust load cell has been replaced by a 1 Kg load cell. This results in a five times higher resolution for the small thrust values we are going to measure. I will power this setup with my 30A laboratory power supply. I decided to measure all propellers on 2S (7.4V), 3S (11.1V), and 4S (14.8V). If some motor/prop combinations run hot on 3S I will most likely skip the 4S trial in order to keep the magic smoke inside the coils. I decided to run on simulated 3.7V per cell instead of 4.2V as this will give you more realistic results. Your battery will be in this area for the longest time during your flight. The ESC is running BLHELI_S with the default settings and can handle 30A (Racerstar RS30A v2). The ESC connects to the power supply via the dynamometer using a 50cm long 14 AWG wire and the motor wires connect directly to the ESC. The voltage is verified by measuring the power supply output and the reading from the dynamometer. If your favorite propeller and/or motor is missing in those lists please let me know about it in the comments section! Plain power, or thrust in this case, is only half of the story. You will always have to keep an eye on the efficiency and maximum current. Even though my new ESC design will cope with lot’s of current, it simply makes no sense to torture your battery with a 100C discharge rate. Even the best 5″ race copter batteries usually do not like being completely drained in 30 seconds. It gets even worse for micro copters because those batteries never reach those C rates. Running small props is the worst choice you can make. The effective area of the propeller circle that generates thrust grow by the square of the radius. For better efficiency you want the propellers to be as big as possible while turning as slowly as possible. The rotation speed really becomes an issue if you want to generate a lot of thrust. Spinning a 2″ propeller at 50000 rpm generates a lot of noise, and in case of any slight unbalance, a LOT of vibrations. This is why I will also include a graph of the max velocities and the resulting level of vibration. I love your experiments and data! Can you please please please please help settle a bet by measuring acceleration and current draw differences in 11xx motors using nylon screws instead of the steel socket-head screws that typically come with a bag of props? I weighed two steel socket-head screws to be about 0.5g / pair. Nylon doesn’t even register on my scale. I can send you the nylon screws that I’m using if you want. Thanks. I do not think this will make a big difference. It will only affect acceleration/deacceleration of the prop and this is hard to measure on a static test stand. I do not think this will make a difference. Compared to the overall weight of the bell and prop the screws are only a fraction of it. 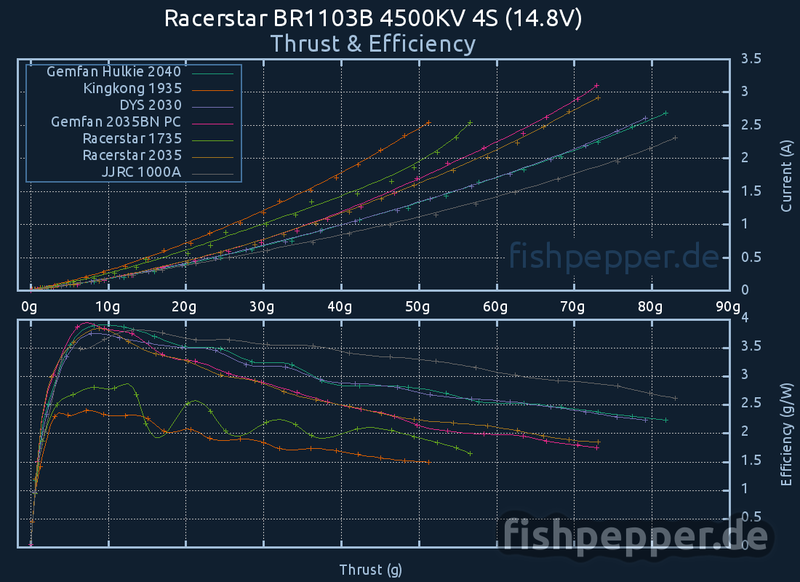 I think you may test more 2 blades propellers like 65mm because for me on my br1103(b) 8000kv, these 65mm propellers (kinkong 1mm hole and racerstar 65mm 3020) give me the best efficiency . One more variable what I am wondering, is the motor timing setting in Blheli. How would that affect the efficiency and would the optimum setting for the angle, be the same for all motors? You should absolutly test gemfan 1105 7500kv (my favourites till now) and brotherhobby 1106 ~6000kv. You are also missing 2035 5blade props (which i love) but also 23xx and 24xx ones for 120mm builds. I have been running the RCX 1105 V2 5000kv with great results on 2035blades at 4s 450mah tattu 75c. I had very good flight times. Easy tune out of the box flyable and efficient motor stay pretty cool. Then I tried also the sunnysky 1106 6500kv (very strong magnets and really tight airgap) then 3s 550mah Gaoneng it has way more power than above RCX motor, but I had to tune completely my drone, was unflyable stock Betaflight settings. Motors become warm and flight times are shorter, defenitively lots more of current, even when hovering it draws more current. The weight of the 3s 550mah or the 4s 450mah is excactely same both 55gram. Both motors are durable and crash proof. I am interested in your testing and findings. I tend to go for setups with more cells, which are less demanding on the batteries lower currents. But I love this bread of small drones it is fantast!! I have heard really good things about the HLY S1103 10000Kv motor with 2″ props. Are you going to add any 1102 motors? I have a setup with racerstar 1103b 10000kv with gemfans 2040 3blade props on 3S 450mah turnigy nano-tech (best Ri of all my batteries till now). Its more quiet and more efficient then my other micros. Its top speed is similar to my other fast ones but its acceleration is not so impressive compared to my super fast gemfan 1105 7500kv with 2035 5blade on 3S.